Pro Modelbuilders is a firm of custom fabricators and modelmakers located in a five thousand square foot workshop in Vancouver, BC, Canada. Most of our projects are scale models (architectural models and topographic models), but we also do display and exhibit work, movie prop work, and prototyping for designers. We serve clients in Canada and the USA. Not only do we routinely ship throughout North America, but we have shipped models as far away as China and Europe. The Pro Modelbuilders team takes pride in meeting the challenges our varied clientele bring to the shop. We work as problem solvers in three-dimensions with a reputation for fine quality finish, responding to the time-sensitive requirements of our clients and competitive pricing. Our client are architects, civic planners, city councils, developers, designers, entrepreneurs, marketing consultants, the film industry, forestry and mining engineers, museums and science centres, property managers, school children - anybody with an idea to be presented in the form of a model. Our shop has been in operation, in Vancouver for over 15 years. Our construction materials are mainly plastics: acrylic; styrene; PVC; ABS. We also use wood and Renshape- a high-density "plastic wood" which is easily machined and can be painted to re-create any type of finish - brick, wood veneer, concrete, etc.. We use lower density foam (7-10 lb. density) for our topographic contour bases. We also create computer files for lasercutting, metal etching, silk-screening, dry transfers, and watercutting as required. 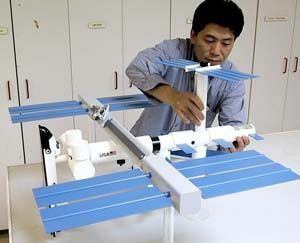 "I wanted to thank you and your organization for the exceptionally fine work which went in into our model of the International Space Station. It is beautifully made, well-mounted, and a very imposing piece of exhibitry."